In 1733, Newark suffered a torrential rainstorm that lasted several days. It was after this storm that Colonel Josiah Ogden, a faithful member of the First Church, hitched up his horse and harvested his wheat. If not harvested, the wheat would have spoiled. Unfortunately it was a Sunday and word of this deed quickly got around. Colonel Ogden was disciplined for Sabbath-breaking. Ogden, the son of Elizabeth Swaine, did not take this harsh criticism and punishment lightly. The controversy was long and bitter. Finally Colonel Ogden withdrew from the church stating "I'll have a church to attend, if I have to build one." It just so happened that Episcopal missionaries were working in New Jersey. Because of this, correspondence between Colonel Ogden, his followers and the Synod of Philadelphia began in 1734. While doing this, the bitter religious controversies in Newark continued. "This separation" says Dr. McWhorter, "was the origin of the greatest animosity and alienation between friends and townsmen, Christian, neighbors, and relatives, that this town ever beheld. The storm of religious separation and rage wrought tumultuously. The openly declared Episcopalians were few, in comparison of the Presbyterians, yet there were two leaders, one on each side, who were pretty well poised in respect of point of abilities, wealth, connection, and ambition. This religious brand kindled a flame which was not extinguished till the conclusion of the late war." The two leaders referred to where Colonel Ogden and the Rev. Joseph Webb, sixth pastor of the First Church. The war was the Revolutionary War. The animosities died down during the Revolutionary War when both churches were used as hospitals. It was during this time that the seats in the church were torn up and chimneys were erected in the middle of the auditorium. But before this happened, the Rev. Joseph Webb was dismissed from the pulpit. Not long afterward he and his son were both drowned in crossing Saybrook Ferry on the Connecticut River. The first charter was granted on February 4, 1746 and a year later it was suspended. The present charter was granted in 1748 by George II. The original church structure was erected in 1733-34. It was made of hewn stone, 63 feet long by 45 feet wide and 27 feet high. The steeple was 95 feet high and 20 feet square. Colonel Josiah Ogden died before the Revolutionary War and is buried somewhere in the Old Burying-ground. (These internment's were later moved to Fairmount Cemetery). The original church building was competed in 1746. The site of the church, according to tradition, was granted by the town of Newark in the Training Place (Military Park). Its original structure, destroyed by fire in 1804, was rebuilt and refurbished in 1810. Its white steeple stood 168 feet facing Broad Street. The church became the Cathedral for the Newark Diocese in 1942. In 1966 the church was united with St. Philip's Episcopal Church and became known as Trinity and St. Philip's Cathedral in 1992. Gives relief to its own destitute members and in instances to nonmembers. Christ Church of Harrison is maintained by church. Conducts a Boys' Club. Girl's Friendly Society House, 28 Centre Street. Has neighborhood meetings in special buildings, such as Trinity House, Rector Street. 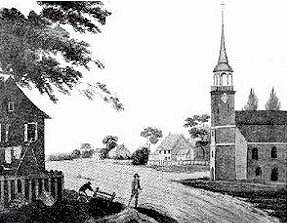 This, the first Episcopal church in Newark, was established mainly through a prominent townsman, Col. Josiah Ogden (1679-1763), who was angered at having been disciplined by the Presbyterian church for having taken in his wheat on Sunday, when a storm threatened. The corner-stone of the present (second) edifice was laid in 1809. Of the earlier building the base is still standing, with walls five feet thick. Also the old front, with Grecian portico supported on missive stone pillars, remains today as first constructed. Inscription erected in 1914 by the New Jersey Society of the Sons of the Revolution: "Commemorating the fact that Washington and his army passed beneath the shadow of this tower in masterly retreat, November, 1776, across New Jersey to the hills beyond the Delaware, where they gathered strength for the blow struck at Trenton and Camden." The church contains a bronze medallion portrait of Phillips Brooks presented by the sculptor, William Clark Noble, in 1906. Church Records from 1696 to 1966 are in the possession of the New Jersey Historical Society.